The natural elements, moisture, and temperature changes can cause concrete to crack, pit, craze, and scale, making concrete repair a necessity. Concrete tends to expand and shrink, becoming susceptible even at an early stage. Concrete structures that are in the process of deterioration may lead to waste, environmental, and disposal problems, which will, in turn, increase shutdown, replacement costs, and become a safety hazard. Proper preventative steps are necessary to increase its lifespan and avoid costly replacements. It’s crucial to address issues on concrete surfaces when noticed. Waiting will only create more risk and disturbance. In order to evaluate the cause of concrete deterioration, a thorough condition assessment is needed. This will help to determine the required repairs and the cost of the services. Once the evaluation is complete, a custom plan is designed to repair the concrete and extend the life of the surface. Asphalt Pavement Solutions is the Philadelphia & Camden concrete repair expert, serving New Jersey, Pennsylvania and Delaware. In order to repair concrete, the cracks are cleared out and a patching compound is used to fill the space. Sand is often additionally used for larger cracks if necessary. When performing concrete repairs, it’s important to allow it to thoroughly dry before use. Our team can handle the unique needs of your specific concrete surface. 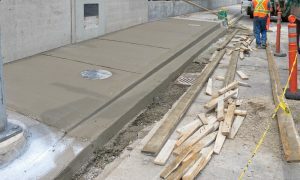 We can repair and restore surfaces including dumpster pats, handicap access ramps, curbs, gutters and sidewalks providing you with superior results that will not only fix the present issue, but also extend the life of the concrete surface; a smart investment for you. Damaged concrete can be, not only a curb appeal issue but a safety hazard. Home and property owners are responsible for injuries that take place on their property, and tripping and falling is a real possibility on cracked concrete. Our concrete repair services provide you with confidence that the job is being done properly and efficiently. Our top of the line equipment and experienced workers have the expertise to ensure the integrity of your concrete surface, completing any necessary repairs in a timely manner and with minimal disturbance to customers and tenants. Protect the attractiveness and value of your property by repairing your damaged concrete as soon as wear indications start to appear. Contact APS today and inquire about our concrete repair services in the the Philadelphia and Camden area.